This section guides you in choosing the paper and planning both the inner pages and cover to produce a high quality book. Fastbind Perfect Binding system means freedom from special supply. Here we tell you what you should consider when using your freedom and producing unique books. Fastbind’s rotary EVA perfect binding system is a modern and unique solution to better binding quality in a cost efficient way. The book block to be bound is inserted into the clamp equipped with stops which ensure accurate positioning and keep the block well knocked up. The clamp closes precisely to the block thickness and fixes it tightly. The block is rotated spine up. The patented Fastbind paper grain opening system (PGO) breaks the paper surface and opens the paper fibre to increase the surface covered with adhesive. The adhesive penetrates from above and is forced into the spine of the book, directly into the paper fibre and between fanned sheets providing strong adhesion. The book block is rotated back into the starting position. The cover is placed and pressed strongly against the book spine from two sides by the unique folding bar, automatically adjusting to the book thickness. This operation both fastens the cover to the block and presses the sheets together, making the binding stronger. With Fastbind machines you can quickly and easily produce professional-quality hard covers and books with wrap-around covers or pads without cover. Thanks to the unique design, Fastbind machines combine high productivity required for larger print-runs with flexibility essential for smaller jobs. Fastbind equipment is exceptionally compact, silent, and easy to use. For the book to be readable the paper shouldn't be too bright white (eyes get tired), but it should still reproduce the colors as well as possible. Offset, laser and inkjet printing all set their specific demands to the paper. Always, when it is possible, plan your print work so that the inner pages have long grain. This eases opening of the book. The grain direction in the cover should be in the direction of the spine. This means choosing short grain card for the cover. The grain direction comes originally from the paper mills process. 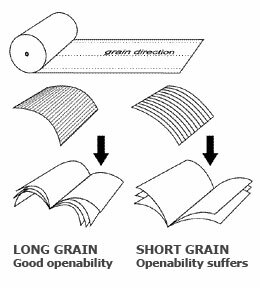 Long grain inner sheets are easy to open as a book while short grain innersheets are not so easy. 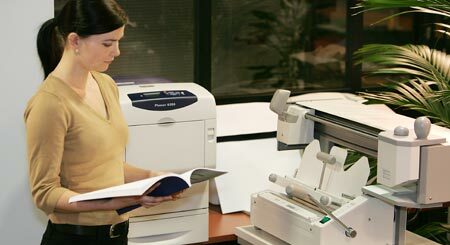 Electronic collating is the main benefit of digital printing for book production. Design your work so that on one printing sheet you have always pages of only one page number. Correct paper grain direction guarantees good openability. It's also possible to print on a bigger sheet e.g. A3 size, but then the sheets of course have to be cut before binding to an A4 sized book. When using card available in the standard assortment of the suppliers of copier & digital printing machinery it is better to design the print work to start from the corner of the page (not middle). This allows you to make your nipping line for i.e. A4 format to stay in one place and allow Fastbind automatic nipping system to take care of the back cover nipping (scores according the size of the spine). 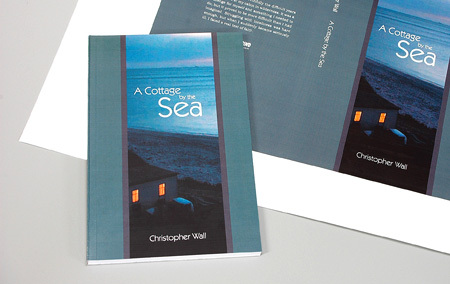 You can bind thicknesses from 1 page to 40 mm and the paper can be up to A4+ size (320 mm). in United States the Statement size is very close to the European A5: it is 5½ × 8½ inches which equals 140 × 216 mm. Therefore the height of the cover sheet must be accordingly bigger. the place to fold the frontpage is 148.5 mm from the front edge. Starting point is the top and front edge of the front page. in Statement size the folding starts 5½" (140mm) from the front edge. The thickness of the pages grows after digital printing. This needs to be considered when designing the cover layout. In Fastbind system the automatic thickness registration helps the designer considerably. Front cover registration depending whether spine text is necessary – in Fastbind system one scoring line is enough – as Fastbind automatic nipping takes care of thickness. Using spine text in very thin books, however, still requires concentration while binding. First insert the cover, then place the book block and align it against the paper guide. Hold the block against turntable with your left hand, push the clamp forward and lock it by lifting the clamp handle up with right hand. Turn the table over by pushing the operating handle up. For thin books, apply glue once or twice. For thick books or books with coated paper, roughen the book spine 1–3 times, then apply glue 2–3 times. Rotate the book block back into the starting position. Push the operating handle down firmly and hold for 5–7 seconds to press the spine and fold the cover. Pull the clamp open and remove the book by lifting the turntable slightly with the clamp handle.